If approaching from the Penrith direction, follow the A66 until you come to the Crosthwaite roundabout at Keswick. Take fist left onto Crosthwaite Road and follow till you came to a T-junction. Turn left then next left onto Carding Mill Lane. Follow this road (behind the old pencil factory) until it opens out into Southey Hill Industrial Estate. We are located in the corner. 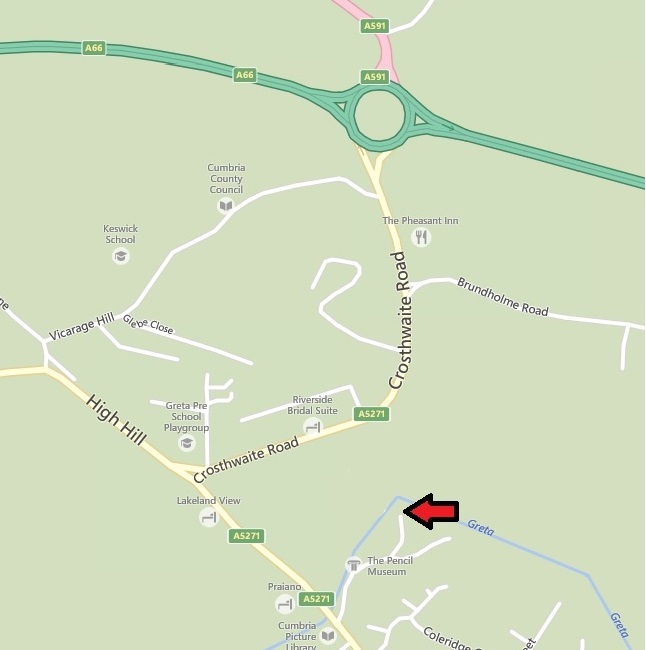 If approaching from the Cockermouth direction, follow the A66 past Braithwaite village and also past the turning to Portinscale. Shortly after the turning to Portinscale is another turning signposted to Keswick on your right hand side. Follow this road, the B5398, into Keswick, take the third tuning on the left onto Carding Mill Lane. Follow this road (behind the old pencil factory) until it opens out into Southey Hill Industrial Estate. We are located in the corner. If approaching from the North. Cross the A66 at Crosthwaite roundabout onto Crosthwaite Road and follow till you came to a T-junction. Turn left then next left onto Carding Mill Lane. Follow this road (behind the old pencil factory) until it opens out into Southey Hill Industrial Estate. We are located in the corner.